Charles Richard Brinkley "Ritch" was born in Colorado City, TX to Sarah & Charles B. Brinkley 3/18/44. Most who knew him remember him for his extraordinary acting talent (backed up by diligent work and superior educational credentials-–M.F.A. in Acting from the Asolo Conservatory of FSU as well as other degrees in the entertainment field such as a B.S. in Communications UT). He held professional ranking in the Screen Actors’ Guild, Actors Equity Association, and the American Federation of Television and Radio Artists. He is also remembered for his talented singing and theatre work particularly at The Milwaukee Repertory Theater and in New York. He is probably best remembered by audiences for his work on the TV series Murphy Brown and Beauty and the Beast and for movies such as Breakdown, Cabin Boy and The Man With One Red Shoe. He took his craft seriously and was himself an educator at several times during his life including being Artist-in-residence at Sweetbriar College, Amherst, VA and Visiting Artist at University of Wisconsin–Stephens Point. . Although not known primarily for his writing, he was exceptionally gifted in that area and wrote a film critic column for "The Beachcomber" (FL) and numerous stories for different venues, some published, many not. He was professionally versed in all areas of the entertainment arena. He was a man of extraordinary courage, compassion, and integrity. He valued intelligent conversation, imagination, loyalty, his friends, (2 & 4 legged), and the truth--no matter where they took him. He loved nature, the well-crafted word, traveling, great conversation, and kayaking He had a voice that would melt rock, and a vocabulary that challenged Noah Webster. Our lives are greatly diminished with his passing. Caterina Cantone è stata una delle più grandi appassionate de La Bella e la Bestia e l'instancabile presidente del Fan Club italiano che negli anni novanta divenne un punto di riferimento per i fans. Ascoltiamola in questa bella intervista dalla quale traspare tutto il suo amore per il telefilm. Caterina Cantone was one of the most devout fans of Beauty and the Beast. She was the president of the Italian Fan Club that in 90's gathered the Italian fans. Here is the link to an interview where she tells all her love for the series. Berardino "Dino" Colamartino, (December 30, 1958-October 26th, 2017) was an Italian born naturalized US citizen who immigrated in 2001 to marry his wife Julia Passamonti after they met in Italy in 1996; it was love at first sight, and a love that never died. Not knowing any English at all, Julia was his "mouthpiece" until he became proficient in English--so much so that he rarely made spelling or grammatical errors! Dino was from Sora, province of Frosinone, in Abruzzo. Even though he came from a background in classical studies, mainly Ancient Latin and Greek, Dino became a highly skilled self-taught mechanic and electrician, having worked as a barista in the family caffe-gelato business as well as repairing commercial espresso machines. He obtained a license in HVAC (heating, ventilation, air conditioning) in 2006 in Massachusetts, and worked on his own repairing small engines, and machinery;he kept Julia's art studio and their home running smoothly. He also flew radio-controlled model planes. Dino was also a gourmet cook, and together with Julia, a fan of BATB. Some may remember him at the 2013 con, where he dressed as "Don Vincenzo." But this is only what he DID in life. Who Dino truly WAS: He was a gentle and skilled intuitive, yet a fiercely courageous soul who faced life head on, overcoming a brutal, abusive childhood, alcoholism at the age of 29 ,quit smoking, and overcame cancer twice, once in 2007 and agin with Stage 4 in 2008, with no chemo or radiation (did acupuncture and alternative healing). Finally, he very peacefully and courageously faced leaving this reality due to emphysema and lung cancer. With so many challenges, Dino never lost his ability to love both humans and all animals, especially cats. As he took his last breath while listening to Julia read the Dylan Thomas poem "And Death Shall Have No Dominion", the reality of this most eloquent poem has come to pass. He still communicates with her, albeit on a different frequency, but his physical presence is deeply missed. I’ve been re-reading our old e-mails, and this is what Jeff had to say about his love for our show. This is from 2009. “When I made the decision 22 years ago to watch BATB, I could have never in 100 lifetimes imagine the impact it has had on my life. I never know from one minute to the next the direction this series will take me but I don't concern myself about it. I just go along for the ride and have enjoyed every minute of that ride. It has helped to change me and I will be eternally grateful for that. I gained an extended family -- through BATB, and on a trip to NYC in October, someone special adopted me as her "little brother" and she, in turn, became my "big sister." A very wise person close to Jeff had the following to say about him. He’s the most sweetest, kindest, caring, and thoughtful man I have ever known. Our world is darker due to his loss, but Heaven is a brighter place. I’m sure that all the BATB family that went before him, were there to welcome him with open arms. How lucky we are that Jeff will live on in the beautiful videos and wallpapers he created. Departed on Mar. 7, 2006 and resided in Cincinnati, OH. Nancy A. “Nan” Dibble, beloved sister of James “Jay” Dibble. Author of several published works including science fiction, fantasy and self-help books. Tuesday, March 7, 2006 at the age of 63 years. No visitation. Memorial Service 7:30 PM Friday, March 10 at Gilligan-Siefke-Grueter Funeral Home, 3671 Warsaw Ave. Memorials may be made to The Scratching Post, 6958 Plainfield Rd., Cinti OH 45236. Michigan B&B fan since 1989, and life-long fan of many other shows. She contributed to the 'Neath the Sidewalks of New York zines. I remember her as being enthusiastic about Classic Star Trek, Star Wars, of course Classic B&B, Dragonriders of Pern, Silver Age Comics DC & Marvel. Authors: early Marion Zimmer Bradley's 'Darkover', early Andre Norton, Georgette Heyer's Regency Romance romps, Tolkien's 'Hobbit' & 'Lord of The Rings', Lois McMaster Bujold's 'Miles Vorkosigan' series and of course Harry Potter! Filk: Mercedes Lackey (who she always called 'Misti'), Julia Ecklar, Leslie Fish's filk anthem 'Hope Erie' and ALL of the 'Fish 'n Ships Players' musicals, and many more. She also proofread many early fanzines- pre-internet mimeographed & dittoed Star Trek, through Xeroxed paper Quantum Leap, all the way up to online HP. She came to at least a few of the 1980s Metro-Detroit C-Cons (Conclave, Confusion, Contraption-now Penguicon). She attended and usually go-fered and/or staffed Lansing Area Pretty Good Cons, T-Cons & ALL the Media West Cons (except one when her Mom was very ill). She went to several of the early B&B Cons, including Las Vegas & New York. She was VERY active in campaigning for the renewal of classic B&B (before we knew what was in store for fans!) and organized the "Crystal Fable' full-page ad in Hollywood's trade journal, 'Variety'- again, pre-internet. She was passionately interested in animal welfare and fostered many, many feral & abandoned pets and found them forever homes (THANK YOU, Jan, for Shirelle kitty!!). She donated $, food & supplies to local shelters and endless amounts of time teaching & problem-solving for pet owners by phone. She bought ads & donated to the local dog show, (where she had showed her prize-winning Bouviers). She also assisted the local Salvation Army by boarding pets in emergency situations ( and I suspect she did all that for cost, or free). She gathered books for donation to local library fundraisers in Chatham and for the 'Gift of Reading' program in Michigan. She always found toiletry items for bundles for the homeless shelters and her Zine Reading Room was 'collection central' for toiletries every Media West Con. She donated to the campaign for clean water wells in third world villages. She loved history & genealogy. She loaned her Father's World War 2 watch & memorabilia to Chatham's WW2 museum exhibit, and was greatly interested in following the excavations at Jamestown (USA), where one of her Gosnell ancestors was the colony's leader. On the 2012 cruise to tropical islands, she found a statue & inscription about that same ancestor's earlier explorations! Besides being a welcoming friend to many new fen (me among them--Thanks again, Jan! ), she was always supportive to the many talented & creative ways fans found to express their enthusiasm. Remember when she organized the Winterfest candle-lighting ceremony at Media West- complete with Tunnel artwork and Vincent?! She also had a joyous time joining in the Media West Plays, happily donning costumes & learning songs. She also loved Ren Faire and could be found in a long black cloak, crystal-tipped staff in hand, wandering to visit with old (and new) friends, delighting in the entertainment and atmosphere. SCA feasts were a treat for her, and she excitedly explored every bit of the LOTR exhibit at Casa Loma in Toronto. Ditto the Egyptian sarcophagi display at the DIA in Detroit. She accompanied Sian Slade (Myfanwy) to Ontario & MI SCA events & had a great time. As a long-time organic gardener, every Herb & Lavender festival was chockfull of new info to learn & old tips/ recipes to exchange. At home in her flower garden she also grew 7' tall organic Catnip, the basis for many fine catnip kitty toys over the decades, and a few record-breaking cockleburs! For a lady who stayed fairly close to home most of her life, Jan made a lot of positive ripples in the bigger world around her! We'll miss you, Jan. Go with the Goddess. JoAnn Grant was one of the co-creators of the Crystal Rose group. Another long time BATB fan who is gone is Ellen Hipsley, who died in April 2011. Although we never met in person and she never was able to attend a convention, she and I had been penpals since the early 1990's. She was a sweet person who loved BATB and her doll collection. She was very thoughtful, always sending me small presents for my birthday and Christmas and calling me now and again if she was concerned about me. She will be sorely missed. Pat Jackson passed away very suddenly on October 31. She was found in her apartment by a friend. She had attended several of our meetings just prior to her passing, so we were all very surprised and saddened. Her brother is also deceased. I was told that her sister-in-law and niece who live in the northwest were going to hold a private memorial service for Pat, but we have not heard when or where. There was not an obituary in the Austin American-Statesman. She is very much missed by us all. 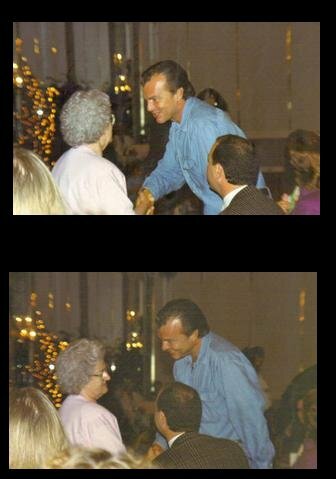 I met Pat in 1994 at my first B&B convention and I saw her at each convention I attended. She was at one BOA meeting and I briefly talked to her there. Pat was very intense and certainly brilliant; I tend to shy away from such intensity because I feel so inadequate. Now as I read her profile, I see that she was involved in several organizations that helped children. She was also a valued member of her church. As far as her involvement in the "Beauty and the Beast" community, I knew that she wrote fan fiction (fanfic): "Count the Ways", "Past is Prologue", The Sublime Myth." I suspect there are others. If you have any more information about Pat, please send it to me. Perhaps there is someone who can put it together into an obituary of sorts. If you d like to be that person, let me know. I do have several photos of her now. I pray that Pat's last hours were free of fear and pain. May she rest in peace. Moira Keeley was such a cheerful, brash spirit, and a fierce fan. She loved Beauty and the Beast and was especially enthusiastic about Ron Perlman. I will never forget the hilarious expedition we took back from a preliminary trip to check out the banquet choices for the first NJ Con. I was wearing my contacts for which I still needed reading glasses. And I had accidentally left my reading glasses at the hotel restaurant. Moira didn't know how to work her GPS, and it was different from mine. She'd had the volume turned down so low, we couldn't hear it. I couldn't see it to figure out how to turn it up. Of course, every time I held it to my ear, I accidentally touched it, and it would change destinations. We ended up on the George Washington Bridge instead of the Lincoln Tunnel. It's a miracle we made it home at all. How we laughed! Moira was the very first fan I met in person, she picked me and Lynn Aoki up from the airport for the NJ 2008 con. We three laughed so much on our way to the hotel, because she kept forgetting I couldn't help her navigate, kept asking me to check if she could turn here or there. I have an extra-special fond memory of Moira who retrieved Annik, Vee and me from Newark that first Wednesday. There was a little unplanned detour due to missing a highway exit, and we all had a good laugh (a great icebreaker). She helped a lot with the 2008 con. Being from NYC, Moira and Elaine knew a lot more about the B&B locations around the city, and I couldn't have planned the Frank Luz tour without them. I remember that dinner we had at the hotel, trying the banquet entrees, that was so much fun! And yes, it was because of Moira that I met Linda H. for the first time in MA at the Berkshires Theater Festival. I also drove out to visit her once. There was a show that I really wanted to see at the Westbury Theater on Long Island. It was the only time I've ever driven out to Long Island and I really had no idea where I was going. I picked up Sonia on the way and we stayed over at Moria's house that night after the show. It's a long drive and I probably would not have gotten to see the show if she had not offered to let me stay over and drive back the next day. This is so sad! Moira was a longtime member of BBTV and fandom in general. She came to several conventions and many of us got to know her. She was a lot of fun, a real live wire. She will be much missed. This is very sad. Moira was the first BatB fan I met in person. She gave me the full tour of the filming locations around Central Park, we went to Shakespeare in the Park, dinner, the whole day was perfect. I'm very sorry to hear of her passing. She was lovely. She wrote with a lovely sense of heart. For those who want to visit some of her wonderful work, she's under the name "Moira Keely" in the fan fic database. She invited us to the Berkshires to see Linda H. in a play. We stayed after, got to talk with Linda and take pictures. Moira hated to have her pic taken, so we don't have many of her from then. She was a free spirit, and I enjoyed her a lot. Moira was such a kind soul and a so much fun! I met Moira at the 2008 NJ con and later in 2010 at the Big Apple Con where we met Linda Hamilton. I've missed her posts as she used to post quite frequently. It was wonderful to see her post this summer, I think, as she was dealing with cancer. Cancer is such a horrible disease, robbing us of so many. "... a noble heart. Good night sweet prince[ss]. May flights of angels sing thee to thy rest!" Marion was a lovely, funny lady whom I met twenty years ago when she bought some of my first books. I don't think she mingled a LOT in fandom, but I know some, especially the old-timers, did know her. I know her passing has left a huge hole in MY heart. Marion really had no family. From what I understand, she is leaving her complete estate to non-kill animal shelters. She had a deep love of the land and the animals, and loved cats in particular. Dottie was a Texas gal, 100% a lady but a hoot and a half, full of vim and vinegar. She hadn't been able to come to cons for quite a few years before her death, but for those of us lucky enough to have known her, she left an indelible impression and we are much saddened that we have lost her. Vera Murphy was one of the earliest fans. She visited the set often and was referred to a "mom" by members of the cast and crew. She was a particular favorite of Ron and Edward. Vera was extremely shy shy until she found Beauty and the Beast, and her love for the series and the cast turned her into a talkative lady who told everyone about the show and cast. She said she talked to more people after reaching 60 than she had in her whole life! God blessed us on 3/3/53, and she returned to Him on 6/17/17 at the age of 64. We were married almost 40 years with yours, mine and our children. Sara, Suzie and Vince. With respect to BATB, she was obsessed from the first episode and very upset CBS cancelled it after 3 seasons. I think she attended the first convention as well as many more afterwards. In the early 2000’s, her asthma condition worsened, and her resistance to germs decreased being hospitalized almost annually with pneumonia. She was almost taken in 2010 but miraculously wasn’t. We were blessed with 7 more years. She never gave up. Never complained. Instead, she was always positive, encouraging, smiling and laughing. She’s no longer suffering and in the arms of our Heavenly Father rejoicing with Him. She is dearly missed but thankful we’ll meet again. Mary Ellen Smith Nicosia was born in Chicago, Illinois on November 16, 1924 and died of natural causes on August 17, 2002. She was a resident of Alameda for 37 years and an Art Teacher at Encinal High School for 30 years. She was active in numerous art associations and promoted the work of her students to help them achieve merits and scholarships in the area of graphic design, fine arts, architecture, and clothing design. Mary Ellen came to Alameda after spending her early years living on a Navajo Reservation in New Mexico where in father was a surgeon and portraitist. From New Mexico, she went to Los Angeles where she studied fine Arts at Los Angeles State University and University of Southern California. While living in Los Angeles she won a scholarship to the L'Academia de Belli Arti in Rome, Italy. She studied in Rome for several years and met her future husband, Francesco Nicosia. They returned to the U.S. in 1959 and settle in the Bay Area. During her years as a teacher, Mary Ellen took time to develop several classroom teaching aids pertaining to ancient art and civilization which were published and marketed by J. Weston Walsh. After Mary Ellen's retirement from teaching, she became involved with numerous network televisions shows as a promotions illustrator which she continue up until the present time. Originals of her work can be found on eBay. Mary Ellen is survived by her two daughters, Antonia and Daniela, as well as many friends and fans of her art work. An open House to commemorate her life with us will be held on September 22, 2002 from 1-5pm, 1728 Clinton Ave. Alameda. Pascal Renwick was a French actor specialized in dubbing, known to French-speaking viewers of the show as Vincent's French voice. Among other well-known roles, he also dubbed Arnold Schwarzenegger as the first Terminator, and Laurence Fishburne as Morpheus from The Matrix. French biography and list of voice roles: fr.wikipedia.org/wiki/Pascal_Renwick. Clips of Vincent's French voice can be heard at Annik's site. Diane Sankey was a long-time fan with whom we recently reconnected through the 2014 WFOL celebration which featured Diane and Sylvia Sing B&B Filks. Click here for obituary and here for guestbook. Nicholas Thalasinos was a victim of gun violence in the mass shooting in San Bernardino, California on December 2, 2015. He is survived by his wife Jennifer whom he met through the Beauty and the Beast Fandom.